The Body Issue | "In good writing, WORDS BECOME ONE with things." I think we can all agree that pregnancy is, primarily, all about the baby it produces. However, once the baby has arrived and the dust settles, you come face to face with the little spaceship your baby arrived in, otherwise known as your body. All of my adult life, and even some of my teenage years, I’ve feared what shape pregnancy would leave me in. Not in an obsessive way, but when I felt like I was in good shape, I’d have this reactive thought: “Well that’s easy for you now; wait until you’ve had a baby and then we’ll talk about how hard it is to get in shape.” I’m not sure where this fear came from; no one I know has transformed into a beast postpartum, not my mother or grandmothers, no close friends. I suppose it’s just a natural anxiety most women have; pretty-young-thing before, overweight-Mama-Bear-from-the-Celestial-Seasonings-box after. So when I became pregnant, I thought about what would happen afterward — but not nearly as much as I expected I would, because a twin pregnancy was as far ahead as I could focus. I hoped that I’d be small-ish again someday, but I didn’t want to psych myself out about it in case the resulting body was completely unrecognizable. I’d say, “You carried two people!” to let myself off the hook if I didn’t snap back in a socially acceptable time frame. Luckily, the Lord made our bodies to be elastic. It’s actually shocking to think that I was this size, and now I’m not. That was four days before I was induced. Thirty-eight weeks pregnant. Waddling. Swelling. Ready not to be pregnant anymore. 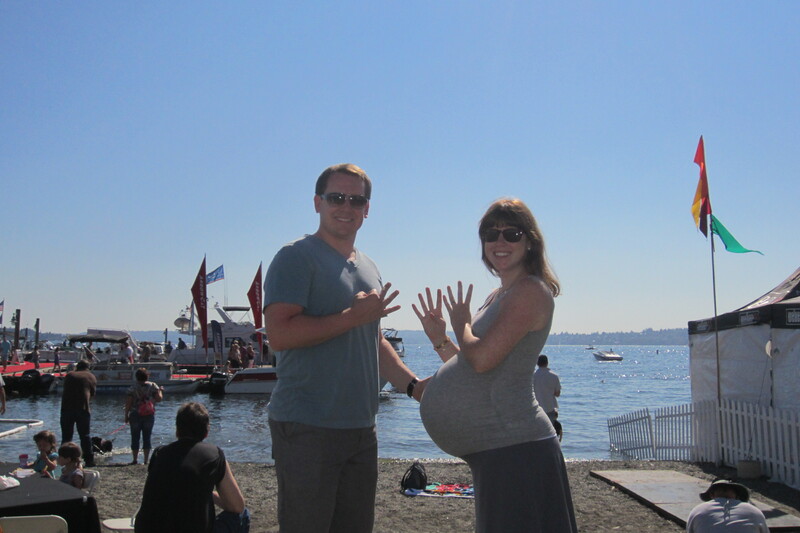 The day after the twins were born, my stomach shrunk considerably. I was still enormous, but so much smaller than before. I completely avoided touching my belly because it felt strange and separate from my body — squishy, empty, loose. It was an eerie sensation so I pretended it wasn’t there. This worked well until the nurses came around every day to push my belly in to ensure my uterus was shrinking back to its original size. File under: Things No One Tells You. Other than that, I didn’t give my figure another thought, and how could I? I was recovering from surgery, bonding with my babies, learning to breastfeed and pump, seeing visitors, and trying to sleep whenever possible. The idea of worrying about losing weight was absurd. 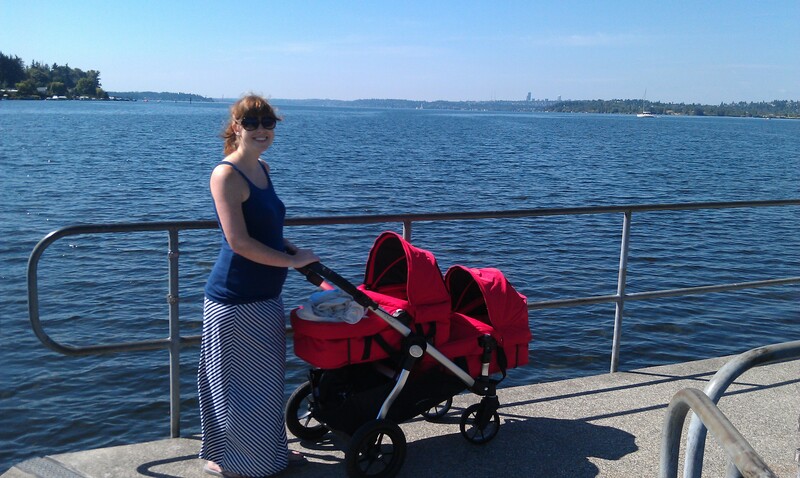 The day after Henry was released from the NICU (babies were 18 days old), Mike and I visited the Juanita waterfront for our first stroll with the bambinos. We walked around and laughed about how I looked like a woman pushing newborn twins while seven months pregnant. 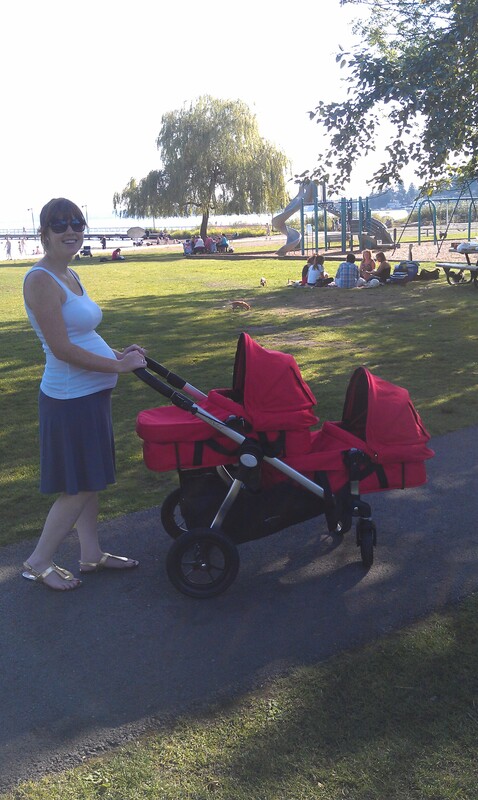 The following day, my sister Erin and I returned to the park for a concert for babies. 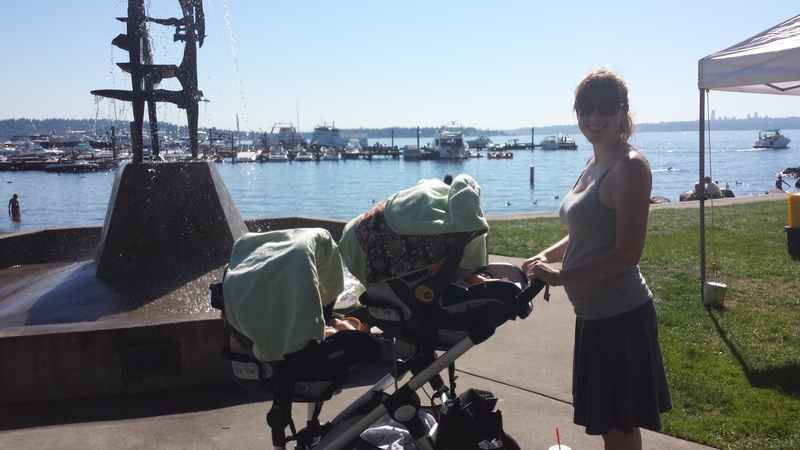 This sounds ridiculous for two-week-old newborns to attend, but it was irresistible to me; sunshine, water, my first “mommy” activity, and the bliss of taking the babies out of the house. It’s strange that my stomach looks smaller in just one day, but that’s how it was — virtually every day it shrank smaller and smaller. Elastic, I tell you. By the six-week mark I looked less pregnant and more generally out of shape, like a passerby might think, do a few sit-ups, why don’t you? 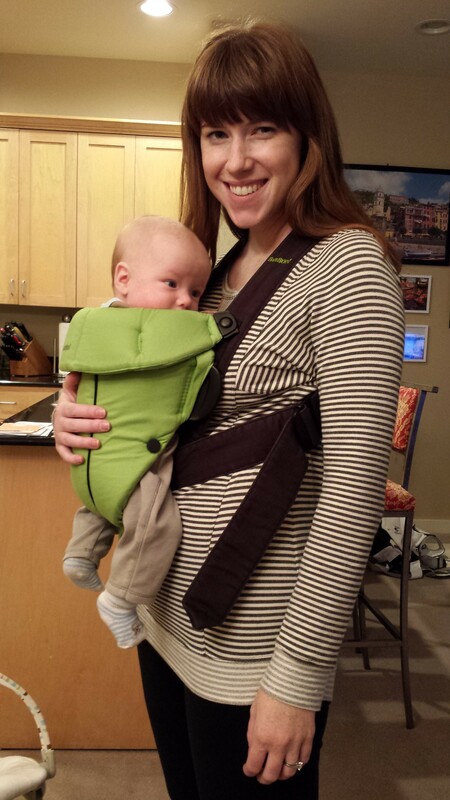 My exercise now consists of stroller walks and the Tracy Anderson Post-Pregnancy DVD. This involves about three thousand crunches, and half as many leg-lifts. I exaggerate, but only slightly. I’m doing it as often as I can during nap-time, and already I feel more held together. I also seriously considered buying that corset-like band, but never got around to it and figured it wouldn’t help that much anyway. Here’s the thing: I wish I was very mother-earth, all zen, walking around saying, “it’s just a body! I got to participate in the miracle of life! Who cares?” But the truth is I’ve never met a woman who didn’t want to return to her pre-baby body. For some people, things fall right back into place, but for most of us we’re left with various parts that aren’t exactly how we’d like them. 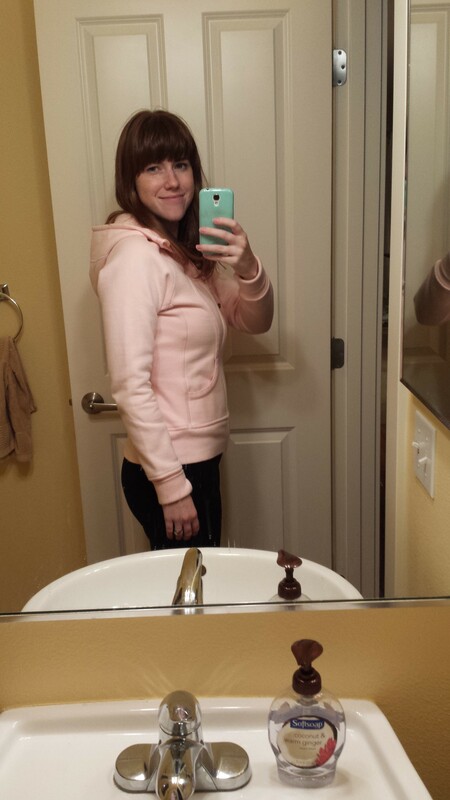 Here I am about three weeks ago, fourteen weeks after giving birth. I am not delusional — I realize I basically look like I did before I had the twins. But let’s be real: I’m wearing leggings that cinch me in and a hoodie that zips me all together. It’s DIY Spanx. Things are not as they were…my body hasn’t sunk like the Titanic, but it’s also not sailing into New York as good as new either. Would you like an example of good as new? She gave birth four days before me. There I go perpetuating the pressure on women to snap back…hardly. Kate is not women’s standard; she’s our dream, and there’s a difference. I don’t think my body will ever be the same, and that’s okay. I have stretch marks, a scar, and — this is what I remind myself — two healthy babies. If that’s what I lay at the altar of my vanity, so be it. Rather than striving for the body I had, I’m moving toward the body that’s awaiting me: new, different, a little flawed, but beautiful. After all, on days when I’m not feeling quite Kate Middleton-esque, I’ve figured out a way to hide that tummy, and it beats the hell out of Spanx. OF COURSE you put in an image of the freak of beautiful nature that is Kate Middleton. Oy vey. So many similar sentiments that I’ve been grappling with! Love your conclusion. Also love all the things no one tells us!! I remember being super concerned about my swollen feet and toes after birth. I must have asked four different nurses about it and they all laughed and said they weren’t very swollen. But for me they were! My toes were numb and tingly all crammed together! I’m glad I’m not the only one! No one TELLS us these things! It’s crazy. The body is amazing and it does things without my signature on the dotted line. I’m just a passenger. So far everything is going really well. Getting to the point of not wanting to be pregnant anymore, but happy they are still marinating in there, safely. Thank you for this post! Your blog has a way of putting my out of scale worries into perspective. Once again Beautiful and so funny the way you nailed just how every woman feels about themselves. Loved it! Love you! Thanks Kathy! I’m glad you can relate!